Should you stick these granola liquids in your pic-a-nic basket? The fresh air, the sun on your skin, and that first bite into a granola bar halfway through your hike—Sounds invigorating, yeah? If you’re one of those granola-lovers out there, then there’s an e-juice brand calling your name. Yogi E-Liquid’s juices are specially crafted with quality ingredients and they use 100% kosher nicotine. When you vape with Yogi E-Liquid, you know that you’re getting top of the line quality e-juice. If you think you won’t be able to taste the difference, think again. Plus, they’re made in the USA. All of Yogi’s e-liquids are available in 0-6mg, are sold in 60ml bottles, and have an 80/20 VG/PG ratio. Expect some nice flavor and great clouds and get ready to take a hike! 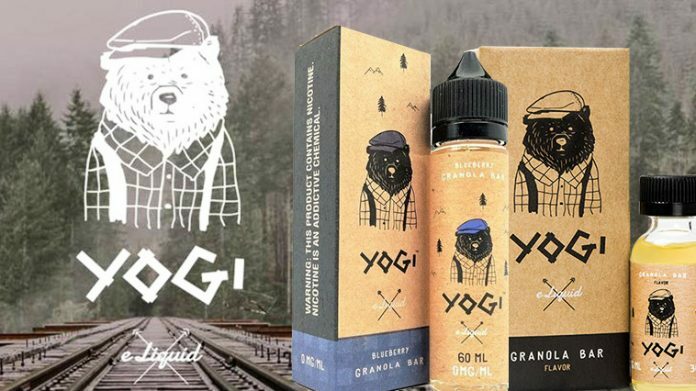 Yogi’s Original Granola Bar e-juice flavor is just about the closest thing you’ll get to oats and honey in an e-liquid. From the first hit, you’ll be able to tell just how much time they spent in the lab creating this flavor. The best part is the sweet honey aftertaste and the smooth throat hit. Because it’s high VG, this vapes best for those who prefer less aggressive hits. And if you’re wondering, the flavor doesn’t get old, which is many vapers seem to agree that Yogi’s Original Granola Bar E-Liquid makes a great all-day vape. If you’re looking for some fruit flavor to compliment the honey notes of the granola, Yogi E-Liquid’s Blueberry Granola Bar is the perfect blend. How can you go wrong with slightly sweet blueberries combined with the nutty-oat flavor of granola? Truth is, you can’t. I’ve experienced some e-liquids that just couldn’t get the blueberry notes right, but Yogi hits it out of the park. Don’t like blueberries, but love the idea of a fruity-granola vape? Yogi E-Liquid also makes Strawberry Granola Bar e-juice. You’ll get that same awesome fruit and honey combo, but with luscious strawberry. ‘Nough said! Last but not least, Yogi E-Liquid sells this stunner: Peanut Butter Granola Bar. It’s almost like those peanut butter and banana sandwiches your mom used to make you, only better. The combination of honey, oats, and creamy peanut butter and banana is a match made in heaven. If you caught me two years ago and suggested I try granola bar flavored e-juices, I probably would’ve been a bit weirded out at the prospect. Not many companies have attempted to create granola-based flavors. But Yogi E-Liquid really created something awesome. If you aren’t a granola-muncher by nature, this juice could turn you into one. The flavors are really nicely blended, they aren’t overwhelmingly sweet, and they stay smooth from one hit to the next. Give Yogi E-Liquid a shot; their juice is superior in quality and just about as impressive in flavor. Feeling adventurous? There are some really crazy flavors out there to try and time is running out! Check out our article on the 5 Strangest E-Liquid Flavors to Try Before You Die. Next articleWhat’s the Shelf-Life of my E-Liquid?